They’re fighting over a single resource that’s more valuable than gold, silver, copper, and oil. And the bitter rivalry for control of this rare substance could make savvy investors a fortune. There’s a vicious battle brewing in a little-known sector of the commodity world. And it’s locked two of the world’s wealthiest billionaires into a bitter rivalry. They’re both fighting over a rare resource that’s become the most sought after — and fought over — commodity on the planet. Each of them is scrambling to claim a stake. It’s absolutely essential to Elon Musk’s growing empire. Musk and his company’s livelihood depend on it. Warren Buffett is also after his own stockpile of this highly coveted raw material. This puts them in direct, head-to-head competition with each other. And there just simply isn’t enough of this essential resource to go around. Things are about to get very, very ugly. But for savvy investors like you and me, this situation is about to get very profitable. You could see every $1,000 that you invest turn into as much as $40,600. After all, the biggest winners in this battle will be those who control the most and best reserves. And this is where the opportunity I’m going to tell you about today comes in. Early investors could be the biggest of the big winners in the battle to control this resource. And they could be rewarded with a fortune far greater than anyone could have imagined. It’s About to Turn Into an All Out WAR! In fact, it’s already on track to replace up to 148 billion barrels of oil or more. This little-known substance is already powering so much of our daily lives. From smartphones, laptops, and tablets to cars, power tools, and even grid energy. Supplies of this resource are already strained. But now, thanks to a series of power moves by Musk and Buffett, this situation is really heating up. Musk needs it to feed his new generation of electric vehicles (EVs). BYD — a major electric car company that has the potential to leave Tesla in the dust. It’s already the world’s largest electric vehicle maker, thanks to its market-leading position in China. But now, the Buffett-backed company has set its sights on dominating another market — the good ol’ US of A. It recently built a brand-new production facility in California. And orders are already pouring in from Facebook and Stanford University. BYD is going to need the world’s entire supply of this rare substance every single year to meet demands. And that’s just to meet the initial amount for its new electric vehicles. Tesla also requires the world’s entire supply of this substance to meet Musk’s annual production mandate of 500,000 vehicles. And he’ll need it year after year. “In order to produce half a million cars a year... we would basically need to absorb the entire world’s [production of this resource],” says Musk. In fact, with 400,000 preorders for the Model 3, worth about $14 billion, this single production run could swallow up 80% of the world’s supply. And this is why the two billionaires are locked in a head-to-head battle to gain control of as much of this resource as humanly possible. Buffett is already pissed that Musk is developing long-haul electric semitrucks because it could steal business from Berkshire-owned railroad Burlington Northern. But he won’t let it happen. Just like he won’t let Musk dominate the world’s lithium supply. And he’ll pay whatever price to make sure of it. It’s a situation that could make in-the-know investors a retirement fortune. So, what exactly is this mysterious substance that’s become the most targeted commodity on the planet? "From chainsaws to push mowers, lithium-ion batteries are increasingly popular"
As you may have guessed, I’m talking about lithium. Buffett realized lithium’s potential before most people understood just how valuable this metal would become. Buffett’s firm, Berkshire Hathaway, bought Duracell for $4.7 billion back in 2014. Duracell also makes lithium-ion batteries, which are used to power everything from smartphones to electric vehicles. But before that, in 2008, he bought a stake in BYD, which as you may recall, is the world’s largest electric vehicle maker. And over the past five years, BYD’s stock has risen 162%. BYD’s expansion plans require a lot of lithium. But Musk wants to absorb all the lithium produced in the world to fuel his growing empire. And it isn’t just these two billionaires who are fighting over it. There’s also Virgin Airlines billionaire Richard Branson and Chinese billionaire Jia Yueting. They’re getting into the electric car game, too. Toyota, General Motors, Nissan, and just about every big automaker have joined the race. In short, a lithium war has broken out across the globe. And these companies are all fighting for a chunk of the world’s small supply of lithium. Of the world’s available lithium, 98.6% is located in just four countries. So, it’s no wonder global lithium production last year clocked in at 35,000 tons. That’s a drop in the bucket compared to annual worldwide demand, which is now 535,000 tons (and growing). And it’s a mismatch that could make you very wealthy in the days and weeks ahead. And another little company that Tesla Motors signed a lithium supply deal with soared 400% over the span of three months. Had you owned these stocks from the get-go, you could have already banked a life-changing 3,963% windfall. That’s how real money is made — by owning the little players that are bucking the trends. I already gave my readers the opportunity to cash a 200% gain on Dajin Resources, a small lithium-mining company operating from Nevada. But this next phase of the lithium boom — and the raging battle for this scarce resource — will make those gains look like peanuts. As you probably know, Musk built a $5 billion gigafactory in the desert outside Reno, Nevada. It’s scheduled to churn out 500,000 electric cars per year by 2020. So, it's going to require a lot of new lithium for batteries. A single electric vehicle battery needs 3,200 times more lithium than a smartphone battery. Tesla’s competitors will make this one of the biggest battles of the century — a battle that entirely depends on lithium supply. Even the firm that Buffett is backing, BYD, has plans for building a gigafactory of its own. “Imagine 1,000 gigafactories — that’s what we’ll be seeing in the coming decade,” says The Australian Business Review. Everybody is scrambling to get in on the ground floor. This is without even considering grid storage, which is set to outstrip electric vehicle demand, and the rising use of consumer electronics. Global demand for lithium is forecast to triple by 2020! But the only thing that’s not increasing is supply. And BYD is in talks with several lithium producers about potential deals for securing long-term supplies. And all this adds up to billions in profits for companies that supply high-grade lithium for batteries. I'm Keith Kohl, the lead energy analyst at Angel Publishing. I dedicated the last decade to following the trends and new energy discoveries that are taking shape in the energy industry. When oil became king in North Dakota, I visited the wells, spoke with the experts involved, and fleeced a string of triple-digit gains from the Bakken. I've even road-tripped to the oil sands in Alberta and met with boots-on-the-ground experts. My point is that I follow the trends and money wherever it flows the most within the energy sector. If you're an oil and gas bull like me, then you have to set your emotions aside and listen to what I have to tell you. Lithium is being hailed as the oil of the 21st century. The recent surge in worldwide demand for electric vehicles has helped trigger a historic bull market for lithium — with prices more than tripling since 2015. After all, lithium is essential to the batteries that power those electric vehicles and also to the batteries that power many of our most sought-after consumer electronics, including smartphones. And make no mistake: The world is now in the early stages of a historic shift toward electric vehicles. Earlier this summer, Volvo announced that beginning in 2019, all of its new models are going to be either a hybrid or an electric vehicle. Ford CEO Mark Fields wants to convert almost half of the company's fleet to electric vehicles. Of course, lithium’s applications extend far beyond the automotive industry. And while demand for lithium continues to increase, worldwide supply is nowhere near enough to the meet growing demand because of how difficult lithium production can be. Over the next 10 years, demand is expected to continue rising by as much as 16% faster than any other commodity from the past century! 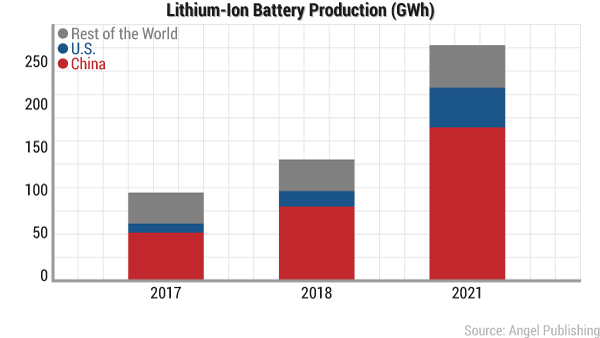 And Goldman Sachs says that for every 1% uptake in electric vehicle use, the increase in battery demand will require 70,000 tons of lithium production a year. Musk and Buffett are about to face even stiffer competition. And it's because several members of the billionaire’s club are getting into lithium for a different reason: To get filthy rich. His investment firm injected $15 million in a battery startup with plans to invest $600 million more. And then there’s Bill Gates, the world’s richest man. Hasso Plattner, cofounder of SAP. They’re putting up $1 billion, to start. With entrepreneurs of this caliber entering the game, it’s time to sit up and pay very close attention. The race to secure supply is on. But it’s getting harder and harder to come by. There’s precious little to go around! South America’s "lithium triangle" is home to more than half of the world’s identified lithium resources. The lithium triangle — which straddles Argentina, Chile, and Bolivia — has explosive investment potential because of the soaring value of the lithium in the ground. But two-thirds of the triangle is off-limits to investors. And it's because Chile and Bolivia are not currently issuing mining licenses. In anticipation of an impending lithium shortage, scientists in Japan are already experimenting with ways to extract lithium from seawater. I can't help but ask, do you really think Musk's move to erect his gigafactory near the salt lakes of Nevada was simply coincidence? It's right on top of the U.S.' only lithium hub — a potentially great source for his supply issue, or at least a portion of it. It's building battery factories that will swamp the market. Bottom line: We're at the end of the fossil fuel era. Our cars will get plugged into walls instead of gas pumps. And our homes will be battery-powered. The world has gone rechargeable. No wonder lithium is being called "the oil of the future." With the world’s energy future literally at stake, it could be the bidding war to end all bidding wars. And the companies I’ve uncovered could already be sitting at the finish line as the clear winners, just scooping up billions and billions of dollars of eager money. 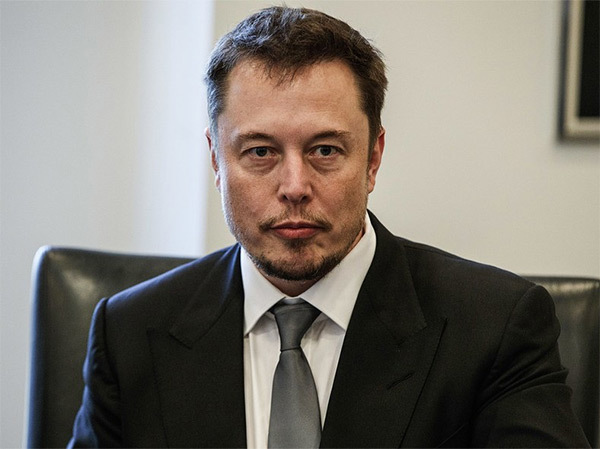 Musk needs to “absorb the entire world’s" production just to meet his company’s demand. But it’s not just the automotive industry that's scrambling to get its hands on it. Some of the world’s biggest and wealthiest firms — like Apple, Google, Amazon, and Wal-Mart — are planning to run their entire operations almost exclusively with lithium-enhanced systems. As you can see, this story is a lot bigger than just Musk and Buffett. Lithium is going to be everywhere. But despite the massive amount of money pouring in, I believe the market is still in its infancy. The entire industry accounts for only $29 billion. To put it another way, currently, the worldwide lithium market is one-twelfth the size of just one oil company — Exxon. But this is about to change in a major way. That’s based on projections by the International Energy Agency (IEA). So, we’re potentially looking at a stunning 24,728% growth rate. In fact, my readers and I have been following the lithium story for years now. And the last place that individual investors like us want to be is on the sidelines. 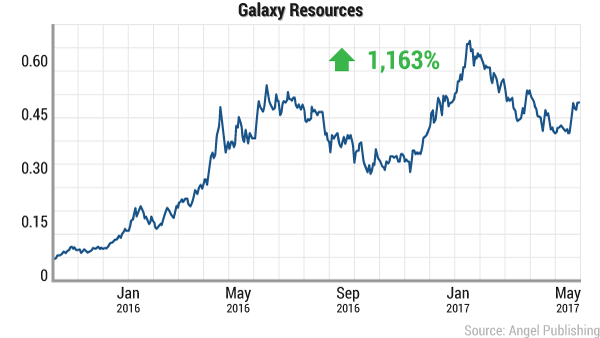 Savvy investors know that the best way to get a slice of this market and bank quadruple-digit gains is by owning the little companies who own lithium gold mines in remote fields. These are the real market players to keep an eye on — the ones that Musk and Buffett will vie for. And if history is any indication, we can watch a small stake of $1,000 multiply to $40,600 in no time flat. It would be enough to set your retirement on track. I’ve done my due diligence to help you enter the lithium investment space in the best possible way, grabbing hold of the ground floor profits as they unfold. This tiny mining exploration company controls the richest lithium reserve in Argentina. Its cache is so rich that it's the world's first large-scale lithium-based field in 20 years. Just how rich are we talking here? It’s estimated to have over 40 years worth of battery-grade lithium production. This is the company’s first full year of production. It’s set to churn out 15,000 tons of lithium. And it’s already pulled in a monstrous revenue of $120 million for the year. This really is the ground floor. Lithium buyers have no choice but to reserve their orders from this tiny miner because the company controls so much of the stuff. It's mind-blowing when you understand how much lithium it controls. Aside from its gigantic lithium field, it 100% owns three other mines in Argentina, including its own refinery. And get this: It has two more exploration projects nearby that look promising. Is this little company in way over its head? It could be, but that would be great news. 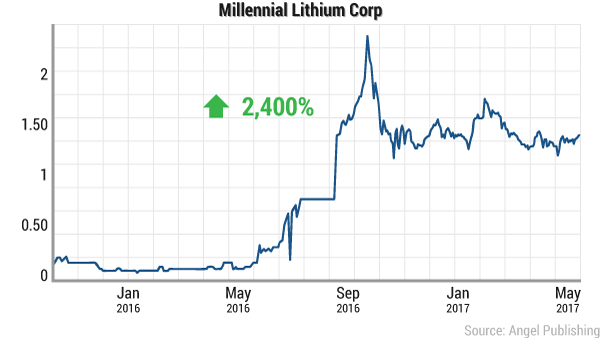 Its market cap is hovering around $550 million, which is pretty small for the amount of lithium it controls. And here's the best part: Its share price sits nicely around $2.67. Any movement could send this stock running wild. If it moves to just $5, we could make back our entire investment in no time. Assuming this stock reaches $10 — an easy and attainable feat — sometime soon, we could bank a cool 274% gain just like that. If history is any guide, we could watch this stock catapult to a sizzling 650%, as others have before it. But to enjoy this ride up, you have to get in at today's price. There isn't a lithium miner that's tinier than this little renegade company. This company has its lithium-based fields strategically located in targets in the Salar basins of northwestern Argentina. It holds an estimated 1.5 million tons of lithium. But it also owns a mine that's strategically located in Nevada — up the alley from Musk's Gigafactory 1. This project could give them an extra 50,000 tons of lithium per year once operations are underway. Will it be one of Musk's suppliers? Or perhaps even Buffett’s? 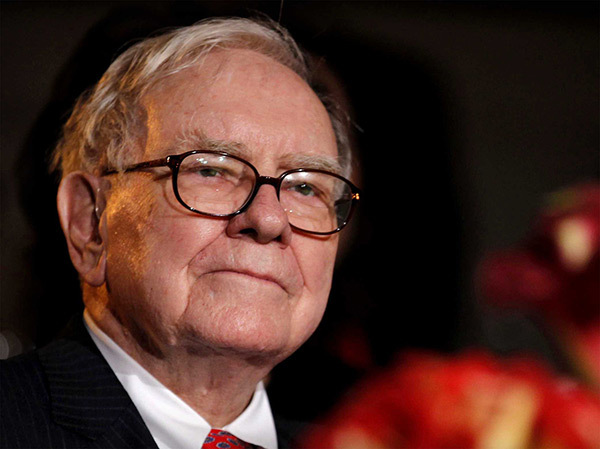 Remember, the firm Buffett is backing is building a production facility in California. Only time will tell, but it's good to be on the right side of this possibility. Because not only will Tesla Motors need lithium, but so will just about everyone. And the great thing is that we're getting in now. This company is expected to realize its full production capacity by the end of 2019. Company insiders are loading up, too. One of its board members recently purchased an additional 50,000 shares of the stock. This little miner is a good ground-floor opportunity, and you can get in for under $1. 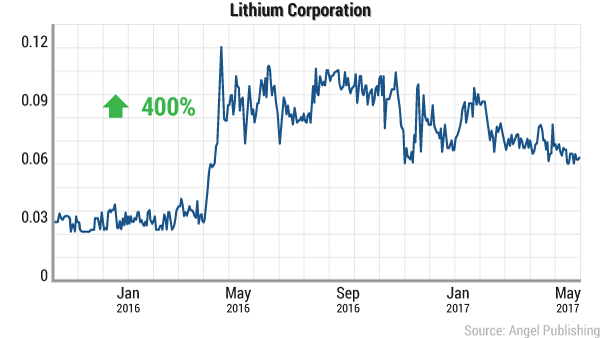 It’s only a matter of time before the battery-driven demand spike drives the lithium price — and this company’s stock — to the heavens permanently. This company is at the heart of the lithium revolution. It has surged 215% and still has more ground to cover. But it's flying so under the radar that most folks have never heard of it aside from insiders and institutional investors. So, we're getting in now in order to enjoy the ride up. If you look at the market cap, it's sitting quietly at $2.75 billion. Yet, it's a leader in the electric battery space. And it will profit from all ends of the lithium energy revolution. First, it provides stored lithium battery packs for industrial electric forklift trucks and other commercial electric vehicles. It's also a proven leader in the electric car battery sector, and its disruptive lithium battery solutions are the go-to for most auto brands. But that's not all. It's also the go-to company for the electric battery needs of high-end clients like the Air Force and the Army. operations, and unmanned ground vehicles. And it can reach far and wide markets, as it operates over 20 manufacturing and assembly plants in Europe, North America, and Asia. Many people have no idea that many of these high-powered machines use sophisticated lithium batteries to run efficiently. But the lithium battery buck stops with this little company. But we're getting in early on the ground floor of the lithium revolution. I hold nothing back. Everything you need to know about these three companies is included in an exclusive investment report I've just written. Time is of the essence, as you've seen, and you can't sleep on whether or not to get in on this new lithium boom. Either you're in or you're not. In fact, getting in early — meaning right now — could mean the difference between a few hundred dollars on your portfolio statement. And this is why I am willing to send you this report absolutely free of charge. It's called: "The Billionaire’s Battle: How to Invest in the Next Phase of the Lithium Revolution." Why am I sending this important and time-sensitive report to you free of charge? If anything, I want to sleep well at night, knowing I made an honest move to put this timely information in your hands. The other reason is because sending you this report as soon as possible is just one of the ways I'll help you get your feet wet in the world of cutting-edge energy investments. The truth is that the world needs energy more than anything else. Everything we use is powered by some form of it. We just can't do without energy. And there's a lot of money to be made in this sector. We've seen it everywhere from the industrial coal age and the oil boom after the 1900s to nuclear in the '80s and also solar and geothermal in the early 2000s. And now, we're seeing it again because of the stored energy revolution. Brought on by cell phones, laptops, power drills, and of course, electric cars, lithium is the new oil that will drive our power needs. And we'll be there to profit from the outset just as we did with the start of the Bakken oil boom in North Dakota. Northern Oil and Gas spiked 103% in just two months. Brigham Exploration popped 316% in just 16 months. Kodiak Oil & Gas — with its 228,000 acres in the Bakken — has soared 6,741% in the past four years. And Triangle Petroleum has rallied 1,077% since 2010! "Keith I'd like you to know exactly how much I've appreciated your Bakken coverage over the years. I sold my position in NOG in Feb 2010 for gains of 216%, 1/3 of my position in BEXP in 2011 for gains of 361% and bought my wife a new car, and sold the rest of BEXP in Oct of 2011 for gains of 743%. Now I'm holding a large portion of your newest pick with unrealized gains of 365%. Thank you." "Just wanted you to know how much I appreciate the hard work you do in finding those great companies for your readers. I am up 252%, 161% and 101%. You've made a believer out of me." And this is why I'd like to send you my hot-off-the-press research report: "The Billionaire’s Battle: How to Invest in the Next Phase of the Lithium Revolution." 12 monthly issues of Energy Investor: You'll receive a full issue in your email inbox during the first week of each month. These monthly issues cover in-depth analyses of what's happening in the energy market and also details on my favorite small energy picks. Portfolio updates: You'll also receive regular updates with up-to the-minute briefings on my recommendations. All energy trades are regularly revised, and updates are forthcoming, signaling when to buy, hold, and sell. This is to ensure that you never have to worry about your trades. I do all the work on your behalf! E-alerts: These are sent straight to your email inbox when an opportunity arises that cannot wait until the next monthly issue. In the fast-paced energy sector, opportunities pop up by the hour. This way, you'll never have to miss a surefire moneymaking opportunity. Customer support staff: If you have any questions or concerns, you can call our support staff to get live help Monday through Friday between 9:30 a.m. and 4:30 p.m. (ET). 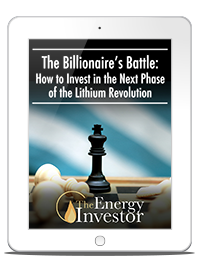 Of course, you'll also have instant access to your free report: "The Billionaire’s Battle: How to Invest in the Next Phase of the Lithium Revolution." Bonus Report No. 1: "How to Steal a Fortune From Trump’s $1 Trillion Infrastructure Boom" — While we're playing up the lithium boom, we won't lose sight of President Donald Trump’s plan to allocate billions of dollars to the development of new oil and gas pipelines over the next four years. And I’ve identified three companies that will be prime beneficiaries as Trump pushes these new deals through. Imagine getting paid every time a barrel of oil travels through a pipeline — these are the kinds of opportunities that are at stake here. You'll learn how to get in now. Bonus Report No. 2: "Top 3 ‘Hidden’ Energy Plays Fueling the Legal Marijuana Boom" — The cannabis sector is actually growing faster than the internet. But what most people don’t know is that it’s also an absolute energy glutton. The marijuana industry is one of the nation’s most energy-intensive, demanding 24-hour indoor lighting rigs and also heating, ventilation, and air-conditioning systems at multiplying grow sites. And I’ve found three energy companies that stand to benefit the most from the booming marijuana industry’s surging electricity consumption. I'd like you to have immediate access to this opportunity. These reports are your instant gateways to the mega-profits yet to come from the lithium era. In addition to these reports, you'll have full access to the Energy Investor portfolio and recommendations, many of which are still buys. You'll also have access to past energy reports with the same caliber of insider details. When you get your all-access, members-only password, feel free to comb our website and read past issues and tutorials. Everything is there waiting for you. And be assured that going forward, you'll be the first to hear about any new opportunities I research. So, how much does Energy Investor cost, and how can you get started immediately? Well, a full year of my exclusive research usually costs $199. But I've asked my publisher to slash this price in half because I want to make sure you don't hesitate to secure your free report and your spot as we get in on the ground floor of this lithium opportunity. Through this special invitation, you can take advantage of Energy Investor for a full year for just $99. Everything else I've mentioned — including your three reports — comes free of charge. Once you sign up, you'll begin receiving my regular email updates and monthly issues. As I said before, you're not on the hook for a thing. By agreeing to this offer, you're only agreeing to try Energy Investor for the next six months. During your trial period, you'll have full membership privileges to Energy Investor. You'll also immediately have access to your free report, "The Billionaire’s Battle: How to Invest in the Next Phase of the Lithium Revolution," again, absolutely free. "How to Steal a Fortune From Trump’s $1 Trillion Infrastructure Boom." "Top 3 ‘Hidden’ Energy Plays Fueling the Legal Marijuana Boom." If after six months you're convinced that you can't make any money with my research, or should you decide that Energy Investor simply isn't for you, just let me know and you'll get your money back. I'm making this arrangement simply because I'm confident this service will deliver profits. America is on the cusp of a new energy era. The profits are as sure as I've ever believed them to be. Then you have to act now. So, if you're interested in trying Energy Investor, I recommend you sign up immediately. Once you're signed up, please read your free reports as soon as possible. They're time sensitive. And when you've invested in the lithium revolution, you'll be positioned ahead of the crowd. Just sit back and watch as your profits pile up while this new energy gathers steam. As a member of Energy Investor, you'll be in a position to know more about how lithium will transform our energy needs, and most importantly, you'll take the early round of profits. I will keep you updated on any information that could help you make more money in this new energy sector. And yes, this is a young and healthy energy sector. It's just getting started. It would be foolish to sit on the sidelines and watch other individuals get all the profits while you're left high and dry. I suggest you sign up right now. Just click below to get started. Once again, you'll have six months to test-drive my research. And if you feel it's not for you, let me know. I will gladly refund your entire subscription fee.